5 December, 2018 (TORONTO, ON) - Following two intimate US performances in 2018, described by VOGUE as “revelatory” and by UPROXX as “staggering grandeur… every single person was laser-focused on that stage and soaking in every bit of the music emitting from it,” Spiritualized have confirmed a full 2019 North American tour in support of their critically acclaimed album And Nothing Hurt (Fat Possum). Spiritualized will kick off the N.A. tour in March with an appearance at Big Ears Festival in Knoxville, continuing with stops in cities including Chicago, Boston, Washington DC, San Francisco and Brooklyn. See below for the full list of dates. Presales begin Wednesday, December 5th at 10am local time; tickets go on sale to the general public Friday, December 7th at 10am local time. 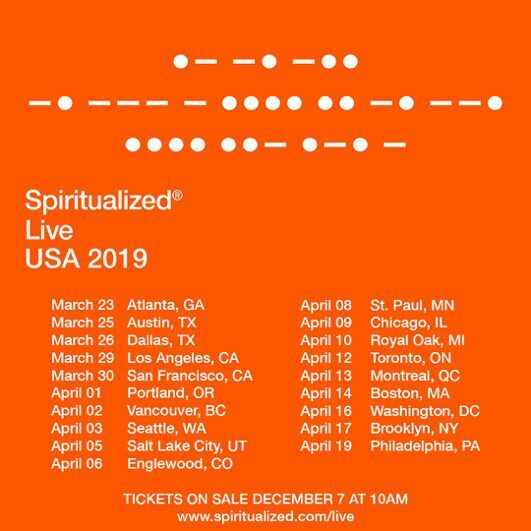 For more information, visit www.spiritualized.com.